The Japanese space agency has announced that they have successfully bombed the asteroid Ryugu. Read on to learn more about their mission. In June 2018, Japanese officials announced that their Hayabusa-2 spacecraft had reached the class C asteroid Ryugu. This week, Japanese officials announced that Hayabusa-2 had successfully blasted a crater into Ryugu’s surface. Why are they bombing the asteroid? Japanese scientists want to see what exists below the surface of the rocky asteroid. They believe that the asteroid may hold answers regarding the origins of the universe. 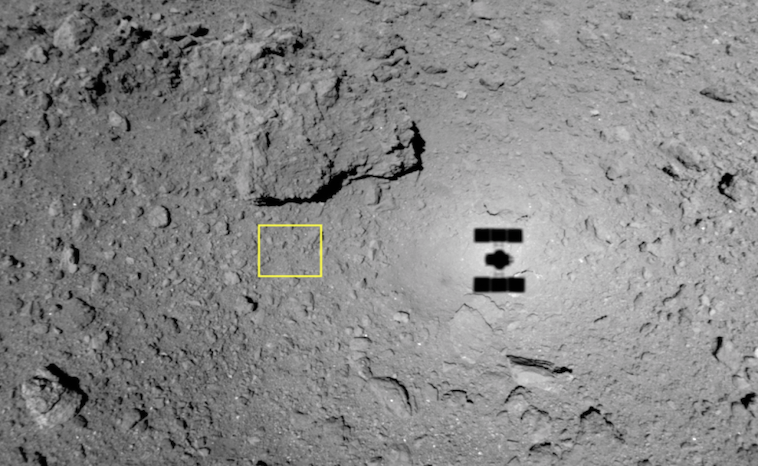 What did Hayabusa-2 launch at Ryugu to make the crater? It dropped a small explosive box containing a copper ball. The ball was about the size of a baseball. It took about forty minutes to reach the surface. This comes from the fact that the asteroid has a weak gravity. The ball then exploded once it hit the surface and blew debris into the air. The risk this time involved debris coming back and hitting the spacecraft. Fortunately, this did not happen, and the Hayabusa-2 spacecraft completed the mission without incident. The Japanese space agency used Hayabusa-2’s camera and confirmed that the impact sprayed particles yards out from the impact to the asteroid. Japan plans to send Hayabusa-2 back to where they dropped the bomb. In the following weeks, the spacecraft will image the crater from high up. They will do this once dust and debris settle. Then they will lower a probe into the crater to collect samples. They hope to collect samples that have never seen sunlight or sun rays. Hayabusa-2 will now need to successfully touch down once again to collect these samples. Scientists from Japan have found hydroxyl-bearing materials on the asteroid. This information came from analyzing near-infrared spectrometer readings. Furthermore, this hydroxyl bearing material may help explain where Earth’s water came from. Japanese scientists have stated that the success of the mission has satisfied them up to this point. However, the mission for Hayabusa-2 is still not over. Once Hayabusa-2 collects the fragments it needs, then it will head back to earth. The spacecraft plans to leave Ryugu at the end of 2019. It will take about a year to reach Earth in 2020. This is not the first time that scientists have blown craters into objects floating around the solar system. In 2005, NASA released a large impacted at high speed onto a comet called Tempel 1. However, they did not collect samples from that mission. In 2014, NASA used the Lunar Atmosphere and Dust Environment Explorer (LADEE) to launch tiny bombs onto the moon’s surface. Its purpose was to figure out what floats above the moon and how it got there. What will the probe find in the crater on Ryugu? It will take years to analyze. They may find the same things that were already on its surface. However, they may discover something more. It would be interesting to see if they find microscopic life. We look forward to following up with its mission to see what they discover.